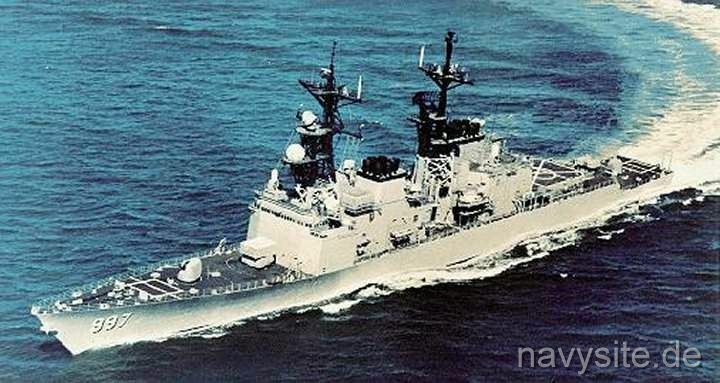 USS HAYLER was the final ship in the SPRUANCE - class of destroyers. The ship was last homeported in Norfolk, Va. Decommissioned on August 25, 2003, the HAYLER was sunk as a target on November 13, 2004, during a multi-national SINKEX 300 miles off the US east coast. Participating in the exercise were the USS SAIPAN (LHA 2) Expeditionary Strike Group (ESG) and several units of NATO's Standing Naval Force Atlantic (STANAVFORLANT). This section contains the names of sailors who served aboard USS HAYLER. It is no official listing but contains the names of sailors who submitted their information. Click here to see which USS HAYLER memorabilia are currently for sale on ebay. HAYLER's crest is representative of Vice Admiral Hayler's inspiring leadership, his dedication to his country, his proficiency as a naval officer, and of the history and traditions of the naval service. The gold stars on the blue background in the upper area of the shield symbolize the many Pacific Island Campaigns Admiral Hayler participated in as a Commanding Officer, and as a Commander of a cruiser division during World War II. The stars also represent the numerous awards he received, some repeated two and three times. The chevron is a symbol of strength and support, and the blue crosses represent the Admirals's three Navy Crosses, an award for valour exceeded only by the Medal of Honor. The crossed red battle axes are a symbol of strength and resourcefulness under fire, and represent Admiral Hayler's wartime service. The two stars they bear are in recognition of the Silver and Bronze Star Medals awarded to Admiral Hayler for valour. The bomb represents naval firepower, gunfire support and anti-aircraft fire, and symbolizes the contributions of Admiral Hayler to the development of naval ordnance at the outbreak of World War II. The anchor refers to the Fleet, and Admiral Hayler's efforts toward its strength and safety. The predominant colors, red, white, and blue, are representative of the National Flag, and Admiral Hayler's patriotism and loyalty to the flag and the nation it represents. 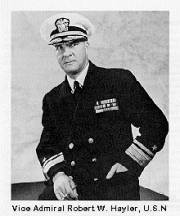 Admiral Hayler was born in Sandusky, Ohio in 1891, but moved to Muncie, Indiana when only a few years old. He graduated from Muncie High School in 1909, and worked for a year prior to entering the Naval Academy, from which he graduated in 1914. At the Academy, he was manager of the football team. His first ship was the battleship USS GEORGIA, which he joined during the campaign at Vera Cruz, Mexico. During World War I, he was aboard the battleship USS OKLAHOMA, which was based in Scapa Flow with the British Grand Fleet. After the war, he was ordered to the Massachusetts Institute of Technology in Boston as a student in ordnance engineering. Following M.I.T., he was ordered to the San Diego-based destroyer Force, where he had command of the USS HOWARD and USS MELVIN. Subsequent sea assignments were aboard destroyers and cruisers. He had three tours of shore duty at the Naval Torpedo Station at Newport, Rhode Island. At the outbreak of World War II, Admiral Hayler, then a Captain, was in command of the newly reopened Torpedo Station at Alexandria, Virginia. He was charged with reopening this factory, which had been idle since the end of World War I. In June 1942, after the manufacture of torpedoes had started, he was ordered to sea in command of the cruiser USS HONOLULU, which he joined two months later in the Aleutian Islands. He remained in HONOLULU until March 1944 and participated in some of the heaviest fighting in the Pacific around Guadalcanal. On the night of 30 November 1942, the HONOLULU was credited with helping turn back the Japanese forces of Savo Island, and was one of the few heavy U.S. ships which was not damaged. ADM Hayler received a Navy Cross for this action. On 5 - 6 July 1943, the HONOLULU helped support the landings at New Georgia Island, and became engaged with numerically-superior, hostile forces. ADM Hayler led a column of ships into this action, which became known as the Battle of Kula Gulf. For this, he received a Gold Star in lieu of a second Navy Cross. A week later at the Battle of Kolombangara, the HONOLULU again lead the battle, and helped in the destruction of at least four Japanese ships. This time, though, the HONOLULU was severely damaged, and had her bow blown off as far back as her forward turret, and also received a torpedo hit in her stern. Fortunately, the torpedo was a dud, and did not explode, although it holed the stern. No one was killed, and the HONOLULU returned safely to port. Admiral Hayler received a Silver Star for this action. In March 1944, Admiral Hayler left the HONOLULU, was promoted to Rear Admiral, and given command of Cruiser Division Twelve, the USS MONTPELIER, USS DENVER, USS COLUMBIA, and USS CLEVELAND. By this time, the war had moved to the Central Pacific, and the Cruiser Division participated in the assaults of Saipan, Tinian, and Palau. Cruiser Division Twelve provided bombardment and fire support for the landings at Leyte Gulf on 20 October 1944. This was the largest amphibious operation in the Southwest Pacific area. For this, ADM Hayler received a Gold Star in place of a second Legion of Merit, his first Legion of Merit having been awarded for his services in the Southern Marianas. On 25 October 1944, ADM Hayler was in command of the left flank of our forces at Surigao Strait, and was the first to receive, and return fire, from the advancing enemy ships. Surigao resulted in the annihilation of a large and vital portion of the Japanese Fleet. For this action, ADM Hayler received a Gold Star in lieu of a third Navy Cross. In December 1944, he was ordered to the Navy Department in Washington, where he was a member of the General Board, and later Senior Member of the Board of Decorations and Medals. In 1948, Admiral Hayler was ordered to Charleston, South Carolina, where he became Commandant of the Sixth Naval District. He was retired in 1951, but remained on active duty as President, Permanent General Court Martial, Great Lakes, Illinois, until 1953. He was then permanently retired, and placed on inactive duty, with the rank of Vice Admiral by virtue of his combat decorations. He moved to Carmel, California, where he had his home. His decorations include the Navy Cross with two Gold Stars, the Silver Star Medal, the Legion of Merit with one Gold Star, the Bronze Star Medal with one Gold Star, the Navy Commendation Medal, which he received for his services at the Alexandria Torpedo Station, and the Navy Unit Commendation for the HONOLULU. HAYLER was built in Pascagoula, MS, at Ingalls Shipbuilding Incorporated. Her keel was laid on 20 October 1980. She was launched on 2 March 1982, and was commissioned March 5, 1983. She is is the thirty-first and final ship of the SPRUANCE-class destroyers. Following an inaugural cruise in the Caribbean, HAYLER participated in her first deployment in the fall of 1984, spending six months patrolling the Arabian Sea and Indian Ocean. 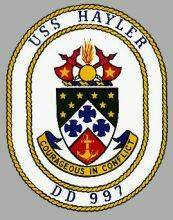 HAYLER was awarded the "Golden Anchor" Award in 1985 for excellence in retaining and reenlisting crewmembers. In 1986, HAYLER departed Norfolk on UNITAS XXVII, her second major deployment and first cruise to Central and South America. In 1987, HAYLER participated in a three month long deployment to the Baltic and North Sea. In 1988, HAYLER was again in Northern Europe, serving as flagship for Commander, Standing Naval Forces Atlantic. In 1989, HAYLER traveled to Norway and England as part of Exercise NORTHSTAR 89 and to New York City for "Fleet Week 89." 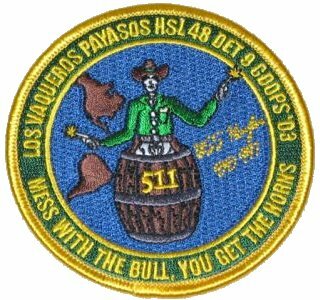 In June of 1990, HAYLER departed Norfolk on her third major deployment, UNITAS XXXI, to Central and South America. In 1991, HAYLER entered Bath Iron Works Shipyard in Portland, Maine for a major overhaul, including installation of the Mk-41 Vertical Launch System, enabling HAYLER to carry 61 Tomahawk cruise missiles. In September of 1993, HAYLER departed Norfolk on her fourth major deployment, to the Red Sea, where the ship conducted a record-setting 327 boardings in support of United Nations sanctions against Iraq. HAYLER was again enforcing United Nations sanctions in April 1994, boarding ships during Operation SUPPORT DEMOCRACY off Haiti. 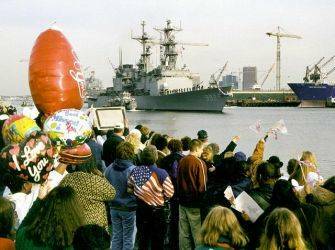 Back in Norfolk for only nine days in May 1994, HAYLER was underway again for BALTIC OPERATIONS 94, operating with 52 ships from 12 nations and making one of the first U.S. Navy recoveries of a Russian Navy helicopter. HAYLER also made several historic port visits to former Eastern Bloc nations as well as a Fourth of July port visit to Portsmouth, England. HAYLER entered Metro Machine Corporation Shipyard in Norfolk, VA, in November 1994 for six months of maintenance. Upon leaving the shipyard in May 1995, HAYLER commenced work-ups, which extended through most of 1996. On 25 November 1996, HAYLER deployed with the THEODORE ROOSEVELT Battlegroup to the Mediterranean. During which HAYLER, flagship for COMDESRON 32, participated in seven major exercises and made eighteen port visits. HAYLER returned to the shipyard in 1997 for three months then commenced work-ups. 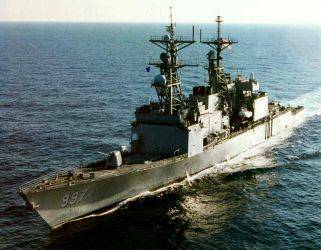 On 13 July 1998, HAYLER deployed with the frigate USS CARR for a six month Middle East Force (MEF-98) deployment. During this busy deployment HAYLER participated in four major exercises. 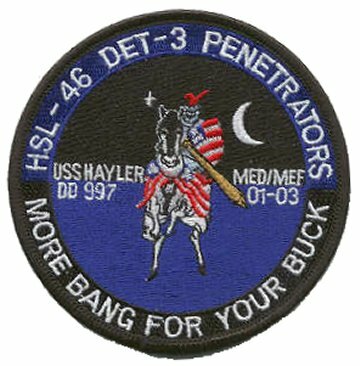 The most notable exercise was Operation "DESERT FOX," which saw Hayler fire several Tomahawk Cruise Missiles deep into Iraqi territory. 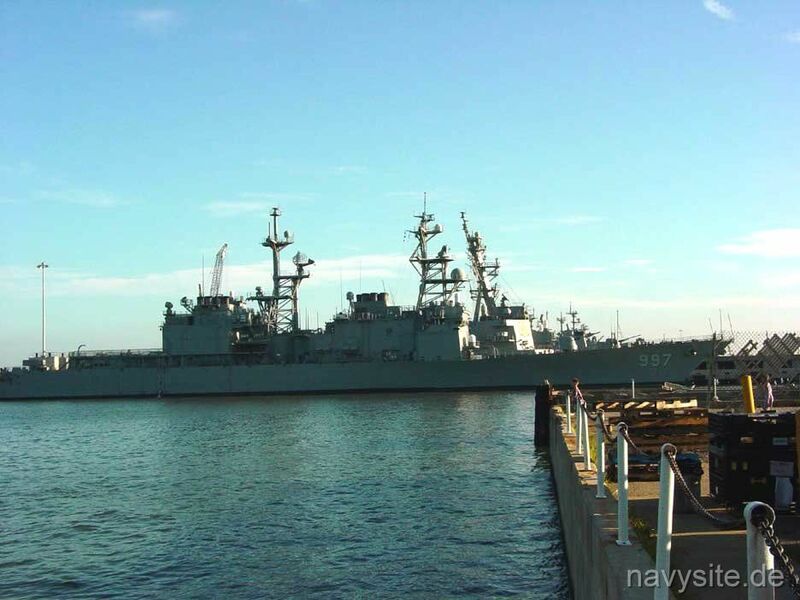 Before entering MHI, Norfolk, VA, Shipyards in the summer of 1999, HAYLER made brief port visits to Boston, MA (St. Patricks Day), Newport, RI, (Surface Warfare Officer School visit ship) and Annapolis, MD (Midshipmen Graduation). 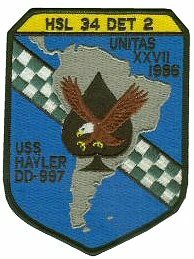 The last few months in the year 2000 found the USS HAYLER participating in UNITAS XXXXI, a three and a half month journey navigating around the continent of South America. The 41st annual UNITAS involved naval forces from the United States, Argentina, Brazil, Chile, Colombia, Ecuador, Paraguay, Peru and Uruguay, along with Marine Corps, Special Operations and U.S. Coast Guard Forces, with a total of about 3,500 U.S. personnel participating. 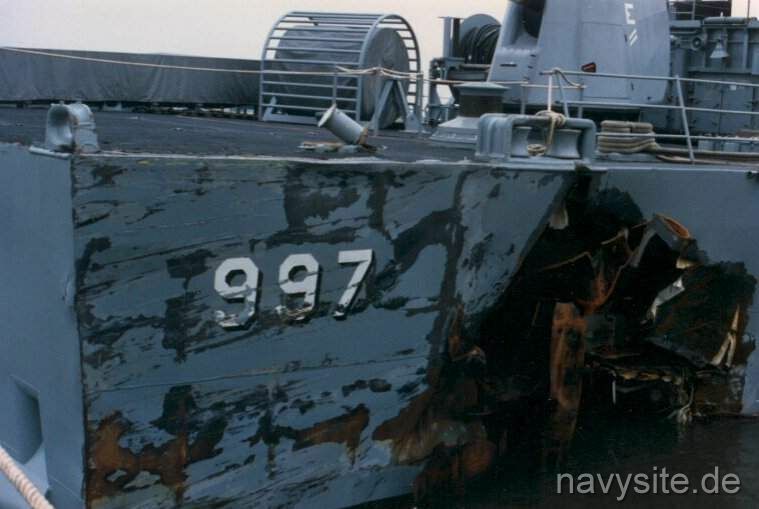 The crew from USS HAYLER proved instrumental in coming to the aid of USS LA MOURE COUNTY (LST 1194), lending both manpower and damage control equipment to that ship after its grounding on September 12. Unitas 41-00 featured a complete circumnavigation of South America for exercise participants. This was accomplished in three phases. The Pacific phase occurred from August 18 to September 5; the Chilean phase ran from September 6-29; and the Atlantic phase wrapped up from September 30-October 21. A fourth phase was conducted in the Caribbean earlier that year and was possibly to be added as a regular feature of future Unitas deployments. In addition, HAYLER's crew made brief port visits in over 8 countries. USS HAYLER returned home through the Panama Canal just in time for Thanksgiving. Because of the accident of LA MOURE COUNTY, the USS HAYLER was not able to make it round the Horn. Therefore, the ship returned through the Panama Canal. USS HAYLER departed Norfolk, VA, on September 19, 2001, with the USS THEODORE ROOSEVELT CVBG for a scheduled six-month deployment and to provide support to Operation Enduring Freedom. With the CVBG and ARG, USS HAYLER had trained during the previous eight months in preparation for this deployment through a series of increasingly demanding exercises and operations. These pre-deployment exercises culminated last month with the successful completion of Joint Task Force Exercise 01-3. HAYLER returned home to Norfolk, Va., in April 2002, after becoming the first Navy warship to perform Maritime Interdiction Operations (MIO) in the Mediterranean in more than 20 years. USS HAYLER left April 4, 2003, for the Pacific to perform counter-drug detection and monitoring operations falling under the area of responsibility of U.S. Naval Forces Southern Command. While deployed, HAYLER disrupted the transfer of 600 kg of cocaine after a high-speed chase, when the vessel being chased beached itself and set itself on fire. In mid-May, HAYLER rescued 75 passengers of a distressed vessel and transferred them to safety. 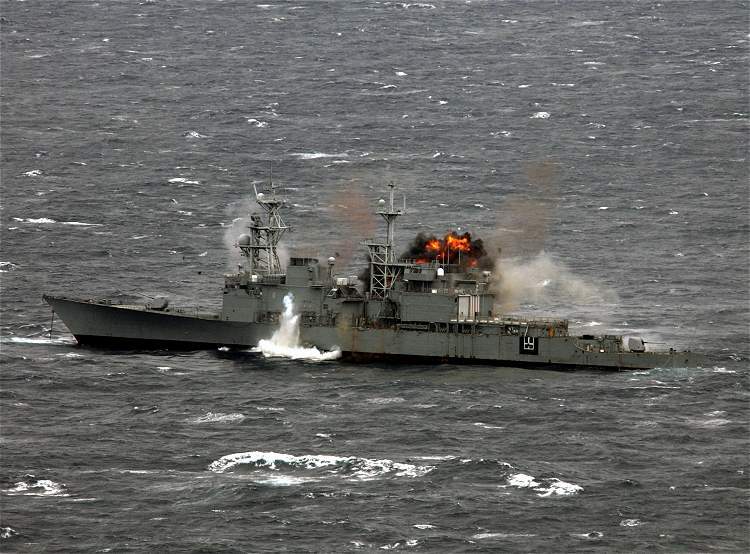 USS HAYLER was decommissioned on August 25, 2003, in Norfolk, Va.
October 23, 1988 North Sea USS HAYLER collides with the West German Navy replenishment tanker RH�N while exercising in the North Sea. Both vessels take on water. HAYLER receives a gash on her starboard side and proceeds to Rosyth, Scotland, for emergency repairs. 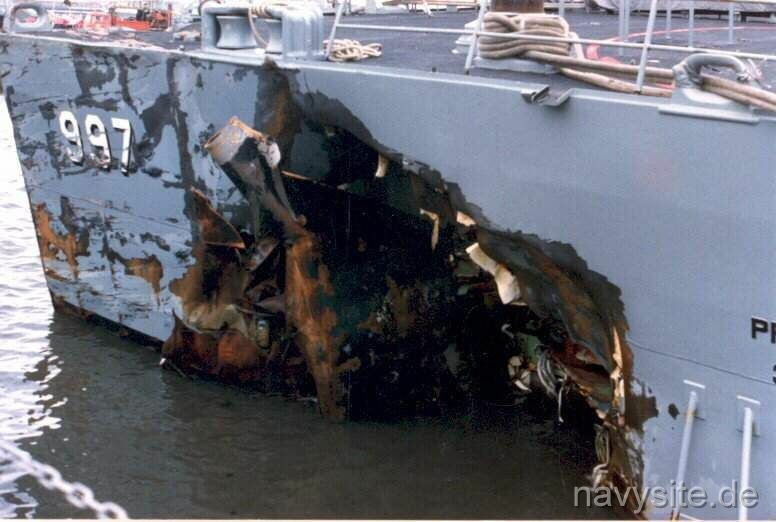 The photos below were taken by Robby Henrichs who served aboard HAYLER at the time of the accident. March 12, 2002 80 nautical miles west of Greece One of HAYLER's SH-60B helicopters crashed in the Mediterranean that morning. Search efforts for the helicopter's three crewmembers, including Rigid Hull Inflatable Boats (RHIB) from both HAYLER and USS ROSS (DDG 71), a P-3 Orion from Patrol Squadron 10 and a nearby British C-130, which was vectored to the area as well as a C-130 from Greece, only found an oil slick and debris believed to be from the helicopter. The search covered an area of 1,000 square miles. HAYLER lost radar contact and communications with the Mayport, Fla., homeported SH-60B Seahawk helicopter, approximately 80 nautical miles west of Greece. The helicopter was a part of Helicopter Squadron Light (HSL) 46. On March 13, at 12:15 p.m. (local time) the search for the three crew members of the helicopter was called off. 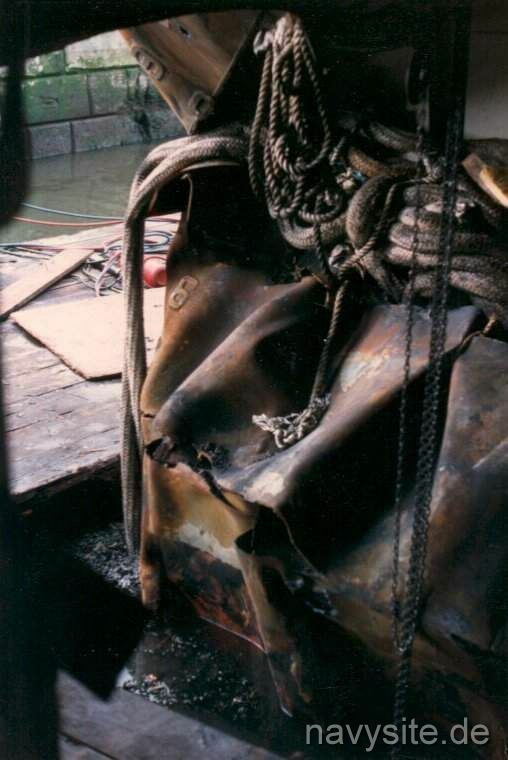 None of the crew was recovered. They were identified as Lt. Terri Sue Fussner, 27, of Manchester, Mo. ; Lt. Wayne Francis Roberts, 34, of Brooklyn, N.Y.; and Aviation Warfare Systems Operator 2nd Class Jason Edward Lawson, 21, of Smyrna, Ga. 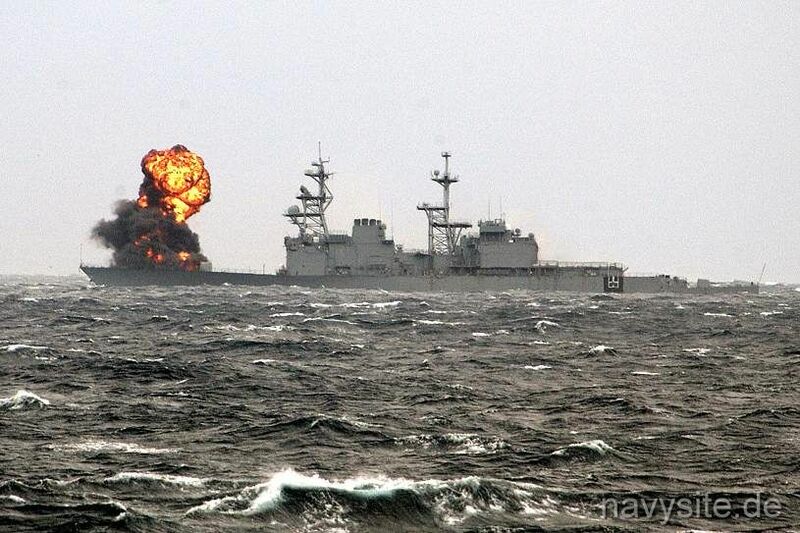 The photo below was taken by Brian Barton when USS HAYLER was at Naval Base Norfolk on July 23, 2002.